Acclaimed composer, Debbie Wiseman OBE, who has written music for TV (Wolf Hall, Father Brown) and film (Wilde, Edie), and is Classic FM’s Composer in Residence, has agreed to write a new piece of music to mark the 75th anniversary of Operation Market Garden, which falls in September 2019. During the Second World War in 1944, RAF Down Ampney played a key part in various operations including D-Day and Operation Market Garden. This audacious operation aimed to capture/secure bridges along the river Meuse in Holland all the way to Arnhem – which proved to be ‘a bridge too far’. RAF Down Ampney sent Dakota aircraft and Airspeed Horsa gliders over to Holland transporting paratroopers and also supplies for troops on the ground. Service personnel from Britain, Canada, the USA, Poland an Holland were all involved in this operation. Each year in September, there is an “Arnhem Service” at All Saints’ Church, Down Ampney, when veterans, and those whose forebears served at RAF Down Ampney, come to commemorate these events and remember those who served at the airbase. Down Ampney village has strong musical links as Ralph Vaughan Williams – the renowned English composer of ‘Lark Ascending” fame – was born in the Vicarage. He named one of his hymn tunes ‘Down Ampney’ which is the tune for the hymn “Come down, O love divine”. Mindful of this musical history, local vicar, The Rev’d Canon John Swanton, thought it was about time the village had another tune to its name! He said, “It just occurred to me that a village with such strong musical associations should be marking this 75th anniversary year with a piece of music. And what could be more appropriate than a ‘march’ for the personnel who served at Down Ampney?” “The Down Ampney March” will be in memory of all those who served at RAF Down Ampney and also for those who currently serve in 47 Air Despatch Squadron, Royal Logistic Corps – whose forbears were based at RAF Down Ampney in 1944. “The Down Ampney March” will be premiered on Sunday 8th September at The Arnhem Service, at All Saints’ Church, Down Ampney, when it will be played for the first time in public by the Cirencester Band, which is marking its centenary year in 2019. It is hoped “The Down Ampney March” will be a worthy tribute to the young men and women who served at RAF Down Ampney 75 years ago and provide a lasting legacy to be heard and enjoyed by many whose freedoms they ensured. The story of the Battle of Arnhem and Operation Market Garden is told in the film – “A Bridge too Far”. Flight Lieutenant Bernard Hyde AE, RAFVR (93) flew with 271 Squadron as a Bomb Aimer/2nd Pilot from RAF Down Ampney in 1944. The English Composer – Ralph Vaughan Williams (1872-1958) – was born in the Vicarage as his father, The Reverend Arthur Vaughan Williams, was Vicar of the Parish of Down Ampney. Ralph Vaughan Williams is known for his British Classical music, much of which was influenced by traditional country melodies and his experiences serving in the First and Second World Wars. 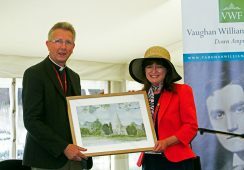 In 2018, there was a successful three-day Vaughan Williams Music Festival held in the village (www.vaughanwilliamsfestival.com) and others are planned for 2020; and in 2022 when we shall be marking the 150th anniversary of RVW’s birth.